Pre-school teachers going for a professional development scheme that prepares them for bigger job roles now have 14 mother tongue language modules to choose from. This will deepen their skills in teaching mother tongue languages, said the Early Childhood Development Agency (ECDA) , which oversees pre-schools. The mother tongue modules take 18 hours each and cover topics from Chinese phonetics to Malay linguistics and Tamil literature and poetry. 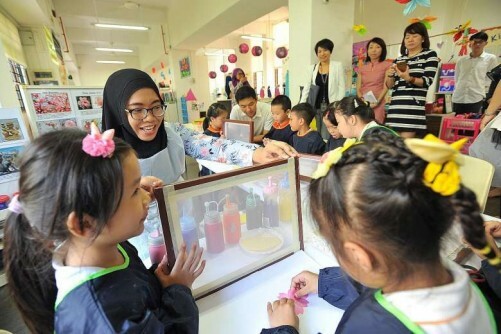 "The strengthening of mother tongue is important because the foundation years, particularly for language, are key," said Minister for Social and Family Development Tan Chuan-Jin yesterday during a visit to My First Skool (Haig Road). A 60-hour module on visual arts has also been added, bumping up the number of modules in the programme from seven to 22. More modules can be expected in future to offer teachers a wider breadth of topics, said Mr Tan. Teachers in the programme have to go through 180 hours of training over three years, to prepare them to take on bigger roles such as senior teacher or assistant level head. The programme, which was announced in September last year, took in its inaugural batch of 138 pre-school teachers in April. Participating teachers go for courses while still working in their pre-schools. While most modular courses take place after work hours, teachers can arrange with their schools if they need to take time off to attend courses. They take a compulsory module in teacher and centre leadership and also do projects in their workplaces. In order to help pre-schools retain their staff, the ECDA pays $12,000 in cash awards to those who stay employed at the same workplace. Ms Nurulhuda Rahmat, 29, an English teacher at My First Skool (Haig Road), is one of the teachers in the first batch of the programme. She has launched a project at My First Skool for pupils to visit cultural places in Singapore and learn more about them through painting and pottery. "I'm able to plan for this project and bring together teachers and deepen their skills," she said, adding that this prepares her to lead fellow teachers in future. Pre-school teachers who want to join the Professional Development Programme need at least three years' experience and must be nominated by their employers. Nominations for the second batch of teachers opened yesterday and will close on Nov 11.